Microcosmos is a wonderful documentary about insects and life filmed in a field in France somewhere. That is of course, if you are fascinated by beetles, snails, and butterflies. Needless to say, it is a hit with the little ones. And even more unexpectedly with Wee Tiny. But I believe for the wrong reasons. The cover may explain this. She insists that she is watching "Buggies on the Moon." We also love Microcosmos video... It's fabulous! 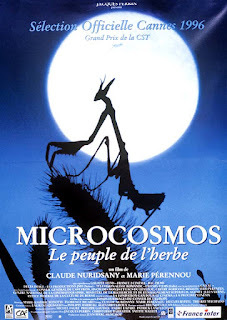 I was quite certain, the first time I watched it, that Microcosmos was where "A Bug's Life" gathered all it's ideas, and I am still quite certain. Rumours abound tummy mountain that a moon expedition to collect rare flora and fauna is in the planning stages. The tummynauts are just waiting for the next sunny day. "A Bug's Life" may have to be examined for collateral information that may assist the expedition. You must make me aware of the consensus regarding the collateral information gathered. A moon expedition sounds quite exciting!